Two years ago, while on a ski vacation in Utah, our family had the pleasure of dining at a restaurant that was new to us: Biaggi's Ristorante Italiano. This 21-location chain, which was founded by Corporate Chef Peter Schonman and two other partners 13 years ago in Bloomington, Illinois, has locations mostly in mid-sized towns in the Midwest and West. After several days of skiing in the Park City area, we decided to take a "day off" and head into Salt Lake City for some sightseeing and a stop at the Discovery Gateway Children's Museum in the Gateway Mall area. While there were numerous restaurants in this area -- and many with gluten-free menus -- it was Biaggi's that caught our eye. Our research beforehand revealed that they had an extensive gluten-free menu, including gluten-free pasta with plenty of gluten-free sauce choices. What more could hungry skiers ask for? So I was thrilled this week when I had the good fortune to speak with Peter Schonman, the Corporate Chef and co-founder of this unique Italian restaurant. In the course of our conversation, I learned a bit more about their gluten-free philosophy and what makes their food so wonderful. Chef Peter shared that he's always had a passion for Italian food and was excited about casual Italian fare, even though he'd come from more of a fine-dining background. He even had the opportunity to live in Italy, where "less is more" when it comes to making sauces and other traditional Italian food. It was here that he gained an understanding of Italian ingredients and how to put them together -- and where he developed a true appreciation for quality ingredients. With Biaggi's -- really more of an Italian/American concept -- he's kept that focus on quality at the forefront of everything they do -- whether it's choosing the perfect blend of cheeses or the perfect tomato that offers a consistent balance of fruitiness and acidity without any preservatives. In his opinion, too many restaurants settle for ingredients that aren't that good, and it makes a difference in their recipes. Biaggi's is what Chef Peter describes as a "chef-driven" restaurant with 80% of their products made in-house. They'd even make their own pasta if they had the space! He believes the average diner is far more sophisticated today, due in large part to the rise of the Food Network's popularity. People have developed a better understanding of food -- and are more intrigued with food. Guests at Biaggi's count on Chef Peter and his team to be creative. This is one reason why Peter prefers not to put things on the menu that people can make at home. Their gluten-free menu, which they first launched about 5 years ago, was the direct result of customer demand. After hearing a larger number of people asking for gluten-free pasta, Chef Peter pushed to offer a full gluten-free menu. 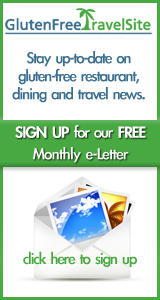 The number of gluten-free diners served has gone from about one per month to 8-10 people every day in each of their 21 locations. The entire staff -- from kitchen workers to servers to the host staff -- goes through a thorough and ongoing training in the gluten-free menu offerings. The spaghetti used is Tinkyada's spinach brown-rice pasta, so the green color helps them differentiate it from the "regular" pasta. The gluten-free penne, also Tinkyada, has a slightly different color and size than "regular" penne, so that prevents confusion as well. And if you miss wonderful pasta, this is something you'd definitely want to order at Biaggi's, because they know how to do it right. It's not surprising that their pasta dishes are among the most popular items on their gluten-free menu. I remember tasting their gluten-free pasta two years ago, and it left an impression on me...they cook the pasta so perfectly you can't tell it's gluten-free. And best of all...all the sauces are gluten-free -- and there are lots to choose from: sun-dried tomato cream, scallion cream, marsala, pesto, and bolognese, just to name a few. Biaggi's gluten-free menu also has a wide range of interesting gluten-free pizzas. They use a par-baked crust from Venice Bakery and take great care to use different pizza screens and pizza wheels -- and even prepare the pizzas in a separate area of the kitchen with their own sauce and oil. The staff also wears gloves to avoid any chance of cross-contamination. Entrees on Biaggi's menu include several preparations of chicken, seafood, pork, lamb, and beef. And you don't have to forgo a multi-course dinner...there are plenty of gluten-free appetizers, salads, and even a few desserts (be sure to inquire about their Gluten Free Molton Chocolate Peanut Butter Cake, which they occasionally feature). Even though it's already one of the best, you can be sure that Biaggi's gluten-free menu will continue to evolve. Chef Peter explained that gluten-free is always in the back of his mind when creating a new menu item. He recently made a slight alteration to the tomato soup to make it gluten-free, and the chefs have been experimenting with "naked ravioli," which is the cheese filling in ravioli served on a bed of sauce, sans pasta (thereby making it gluten-free!). If you're lucky enough to have dined at any of Biaggi's locations, please share your experience -- and the dishes you'd recommend -- either as a comment below or by submitting a review to our sister website, GlutenFreeTravelSite.